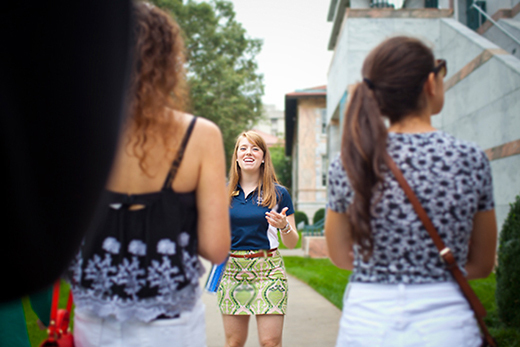 Tour guide Maddie Clifton shares her Emory story with prospective students and parents. Emory Photo/Video. and the freshman dorms to the Woodruff Library and the dining hall at Dobbs University Center. The Savannah native also sprinkles in fun facts about her own Emory experience, such as how she used the writing center to help get an A on her first college essay, and where her favorite study spot on campus is located. A double major in political science and interdisciplinary studies, Clifton tells prospective students that it was the opportunity to study liberal arts and pursue research that attracted her to Emory. Accepted to both Emory College and Oxford College, she chose to start at Oxford for the historic campus and sense of community she felt at Oxford. High school senior Austin Ragusa and his father, Mark Ragusa, were on Clifton’s tour on an October morning. No strangers to the process, it was their seventh college tour. Joel Dobben 12C, an undergraduate admission counselor, coordinates the Emory Student Ambassador program and served as a tour guide himself as a student. “We are looking for students who are very adaptable and articulate, who are able to share their love of the university and think on their feet,” says Dobben. Students interested in becoming tour guides apply in the fall and undergo an extensive interview process. It’s a popular job; this year, 250 students applied for seventy spots. Each new crop of tour guides is selected to represent a range of academic and extracurricular interests, backgrounds, and experiences. Those chosen receive a manual and ten hours of training, shadow an experienced guide, and then conduct “buddy tours” with another trainee before they can lead groups on their own. Within basic parameters, they’re encouraged to make the tours their own by letting their personal style and experiences shine.